A terrific win for the Giants who again battled injuries, but got big games out of Rory Lobb (14 hitouts to advantage, ten contested possessions and eight tackles) and Harry Himmelberg (12 score involvements). Adelaide has now scored 3.2. (20) from centre bounce clearances tonight and average only six points per game from this source. Another terrific stoppage goal to Jacob Hopper. Both teams have won 14 forward half clearances, but the Giants have scored 2718 points from this source. The Crows have a 2515 advantage in ground ball gets this quarter that is driving a 37-21 contested possession differential. Adelaide lead 71 in hitouts to advantage in the final quarter, with this contributing to a 13-3 dominance in clearances. The Crows have lost the tackle count by seven per game this season (ranked last). Tonight the Giants lead the tackle count 7157. Giants InterchangeHeath Shaw and is possibly out for the game. 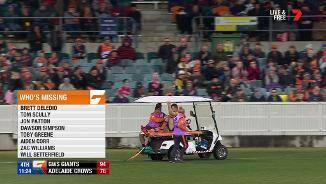 The horror run with injuries is continuing for the Giants with Reid, Kelly and now Shaw off the ground tonight. Shaw has contributed a teamhigh eight intercept possessions, 20 disposals and 412 metres gained tonight. In the final quarter, Adelaide lead the clearances 83, contested possessions 21-16 and uncontested possessions 25-19, and has now had five of the last six inside 50 entries. A classy snap goal from Richard Douglas keeps the Crows in the game. The goal again came from a defensive half chain with the Crows scoring all four second half goals from such chains. Giants InterchangeLachlan Keeffe off due to an injury. An important win in a oneon-one contest by Jeremy Cameron provided the opportunity for the last goal. 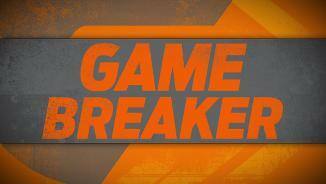 GWS leads 10-5 in one-on-one contest wins, and is ranked second this season for winning such contests. GWS has had 94 percent time in forward half to start the final quarter with a 40 lead in forward half intercepts during this period. A second goal to Aiden Bonar from his third forward 50 mark, and he is starting to display his prodigious talent. Bonar has averaged 21 disposals, 13 contested possessions and six tackles as a midfielder in the NEAFL this season. Lachie Whitfield is averaging careerhighs this season for disposals (27) and metres gained 494). Tonight he has now gained 414 metres from his team-high 22 disposals. 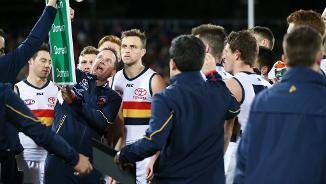 This season the Crows average 34 points from 25 forward half intercepts. Tonight Adelaide has scored 2.4. (16) from 20 such intercepts, with the Giants able to defend their own defensive half turnovers. GWS dominated the third quarter with 64 percent time in forward half, 197 inside 50 entries and ten scoring shots to five. The Giants had kicking efficiency of 72 percent compared to the Crows 58 percent in the third quarter. An excellent goal from a stoppage to Jacob Hopper and the Giants now lead 4335 in points scored from stoppages. Greater Western Sydney has averaged 36 points per game from its clearances this season (ranked second). All three goals to Adelaide this quarter have come from defensive half chains, with the Crows working back into the game with three of the last four goals. While GWS has had more disposals this quarter (7347) it has also recorded more tackles (17-8) with its deep midfield taking control of the game. Adelaide has now scored 7.2. (44) from set shots at goal, while GWS has scored 3.4. (22) from its set shots at goal. 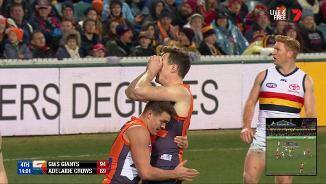 Rory Lobb leads Sam Jacobs 83 in hitouts to advantage in their ruck contests, and the Giants lead 14-9 overall in this count, with this contributing to a 36-25 lead in first possession wins at stoppages. 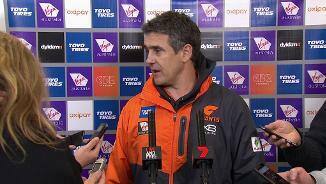 Giants InterchangeJosh Kelly and is possibly out for the game. A rare forward 50 entry for the Crows is converted into a goal by Bryce Gibbs with Lynch providing the assist. Gibbs has averaged 27.4 disposals per game across his career against the Giants, which is his secondhighest return against any team. The inside 50 count this quarter is now 131, with the Giants dominating both contested possessions (21-14) and uncontested possessions (37-19). GWS leads 4027 in hard ball gets with eight different players recording at least three of these, while the Crows have only four players who have recorded at least three hard ball gets. All oneway traffic to start this quarter, with Kelly making it four goals in a row to GWS. Kelly has a team-high 376 metres gained tonight for the Giants. 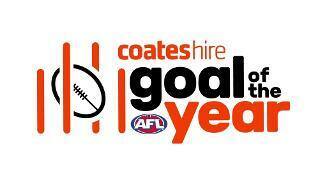 A forward half stoppage goal to Dylan Shiel and the Giants have now scored 2.3. (15) from this source, while edging ahead 2928 in points scored from stoppages. GWS has had 84 percent time in forward half to start the third quarter in a turnaround from the first half when Adelaide won the territorial battle. A courageous mark and goal from Harry Himmelberg who has continued his recent good form tonight. He has a gamehigh ten score involvements which includes two goals and three assists. The Giants lead 141 in uncontested possessions to start the third quarter, and have had the first six inside 50 entries. GWS has had seven of the last eight inside 50 entries (including the first three this quarter) and also had five of the last six scores, but only scored 1.4. (10) during this period. Brodie Smith has had a big first half for the Crows and leads all players for intercept possessions (seven), disposals (17) and metres gained (360). The Crows have averaged 16 points per game from their forward half clearances this season (ranked third), and tonight have scored 2.2. (14) from seven forward half clearances to half time. A good first half from the Crows, who despite conceding contested possessions to the Giants (6883) have had 58 percent time in forward half and hold a 31-21 lead in inside 50 entries. A counter attack goal for the Giants after Adelaide had a run of eight consecutive inside 50 entries. Adelaide lead 186 in forward half marks and 81-53 in forward half disposals in an indication of which end of the ground the ball has been. Adelaide leads the clearance count 106 this quarter with Rory Sloane prominent. The star Crow has won nine of his team's 18 clearances. Adelaide has had 62 percent time in forward half this quarter, and now leads the inside 50 count 2616 with the Giants trapped in their defensive half. Adelaide has now scored an accurate 5.1. (31) from its set shots at goal, with Lynch again involved in the scoring chain. Since the start of 2015, Lynch is ranked No.1 in the AFL for total assists. Greater Western Sydney has recorded a tackle efficiency of 68 percent this season (ranked No.1). Both teams have a tackle efficiency tonight of 76 percent, with the Giants leading the tackle count 3329. Consecutive goals to the Crows, with Tom Lynch already up to six score involvements, which equals his season average. Adelaide lead 42 in forward 50 marks, with three of these taken by Lynch. An opportunistic goal to Eddie Betts, gives the Crows their first score of the game to come from a chain started in the defensive half. GWS has generated four of its scores from defensive half chains. 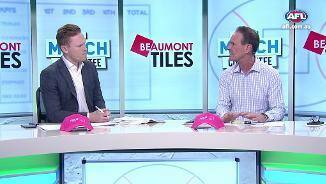 Tom Doedee has already taken three intercept marks among his four intercept possessions. With Jake Lever moving to Melbourne this season, Doedee has assumed this role and taken more intercept marks than any other Crow this season. While Adelaide has an 1813 lead for inside 50 entries, GWS leads forward 50 disposals 21-9. GWS currently leads 92 in forward 50 tackles. The Giants average 11 such tackles per game. The opening goal of the second quarter to the Giants was sourced from a forward half intercept. GWS averages 28 points from 24 such intercepts, and tonight has scored 1.2. (8) from seven of these intercepts. GWS won clearances 146 in the opening quarter, but the Crows scored three goals to two from this source. The Giants had the better of contested possessions in the first quarter (3929), but undid this advantage with 52 percent kicking efficiency compared to the Crows 61 percent. Brodie Smith currently has a gamehigh 11 disposals and has already 233 metres gained in a positive start to just his second game back this season. Adelaide has generated the last seven inside 50 entries of the game and scored 2.2. (14) during this period of territorial control. 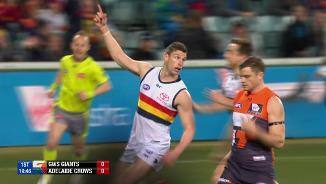 All three goals for the Crows have come from stoppages. Adelaide averages only 28 points per game from this source (ranked 12th). The slick ball movement of GWS is already on display. The Giants have already scored 2.1. (13) from four chains starting in the defensive midfield. The Crows have not scored from six chains starting in the same zone. Stephen Coniglio, who kicked the last goal for the Giants, recorded careerhighs of 36 disposals and 24 uncontested possessions last week against Carlton. Coniglio is averaging career-highs this season for disposals, inside 50s and score involvements. A second centre bounce goal for the Crows with the accurate set shot at goal from Tom Lynch who has been involved in all three scores for Adelaide. Over the past four weeks, Greater Western Sydney has scored from 24 percent of its chains starting in the defensive midfield (ranked No.1), and its second goal of the night was launched from an intercept in this area of the ground. 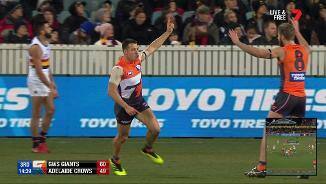 The first goal for the Giants was sourced from a forward half stoppage. GWS averages 18 points per game from this source (ranked second). 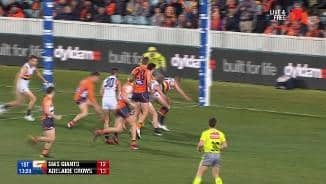 A centre bounce clearance and goal to start the game for the Crows who are ranked last at scoring from this source in 2018, averaging just six points per game. Since 2014, Adelaide has won the clearance count by five per game against Greater Western Sydney, which is the best differential recorded by any team against the Giants in this period. The Giants have lost only 23 percent of their defensive oneon-one contests this season, which is the lowest percentage recorded by any team, while the Crows have won 32 percent of their offensive one-on-one contests this season (ranked second). Greater Western Sydney average three more clearances than its opposition this season (ranked second), while Adelaide averages three fewer clearances than its opposition (ranked second last). Welcome to UNSW Canberra Oval for the GWS Giants v Adelaide Crows Round 21 clash. AN INJURY-HIT Greater Western Sydney has consolidated its spot in the top four while ending Adelaide's season with a 14-point win in Canberra on Saturday night. The Giants' 13th victory of the season – and fifth in a row – was hard-fought as the Crows' slim finals hopes were on the line, but Leon Cameron's men held on to win 15.16 (106) to 13.14 (92). 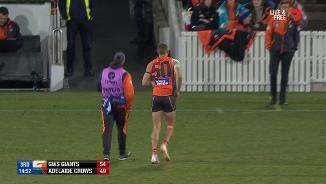 But GWS's cursed run with injury has continued as veteran defender Heath Shaw (knee), All Australian midfielder Josh Kelly (concussion) and Sam Reid (hamstring) all failed to see out the match. 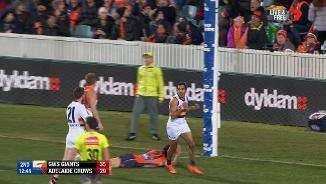 Kelly was knocked out after a heavy tackle from Crows skipper Taylor Walker in the third quarter that is certain to draw attention from the match review officer. 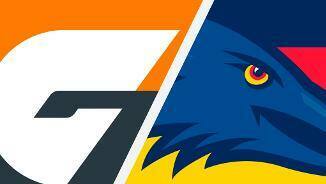 Despite being down to one fit player on the bench, GWS was able to hold out a determined Crows team, desperate to avoid missing the top eight following a Grand Final appearance last year. 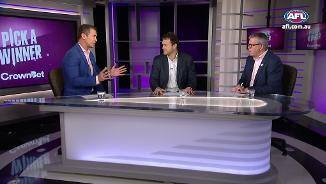 Greater Western Sydney: Sam Reid came from the ground early in the third term with a hamstring issue and played no further part in the game. Josh Kelly was knocked out by a Taylor Walker tackle in the third quarter and spent the rest of the match on the bench. 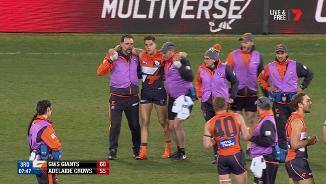 Heath Shaw was stretchered off in the last quarter with a left knee injury and will be sweating on scans in the coming days. 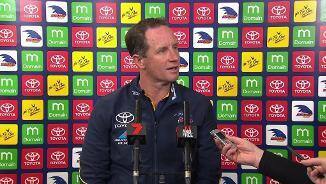 Adelaide: The Crows got through without any injury worries. 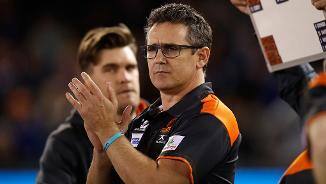 The Giants head back to Spotless Stadium to host the Swans in what will be a massive Sydney derby on Saturday, while the Crows are in Adelaide to face North Melbourne in the Sunday twilight fixture.